Let me start this review by getting straight to a fact that’s it’s been ages since i got my hands on any real crime fiction. Sweeping my feet off the cozy teen fantasies to read any other genre is an uncanny valley right there! *shudders*. Agatha christie’s murder thrillers, The Da vinci code and Arthur conan’s juicy Sherlock tales were my only transit to adult fiction. 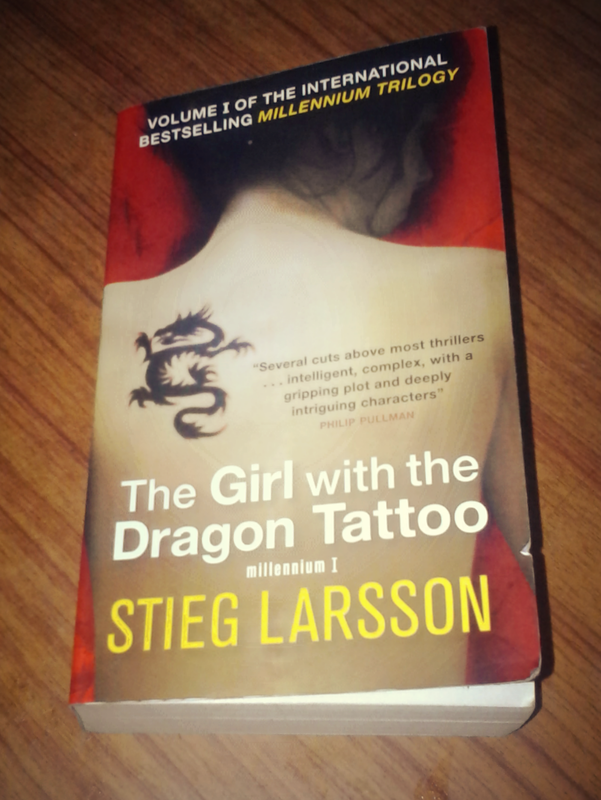 When i picked up Stieg Larsson’s ‘The Girl with the Dragon Tattoo’, i considered it more as a challenge to myself than just another casual read. Surprisingly, i ended up nail-biting at the last phase of this mystery labyrinth. A smashing read for thriller freaks! Anyone who is a fan of Dan Brown is certain to love this author’s writing style because of the similarity. Mikeal blomkwist is an assiduous journalist who is sent on a quest to unravel the mystery behind the disappearance of Harriet vanger, a grandchild of the renowned chairman of the vanger corporation. Mikeal is accompanied on an eerie investigation with an intimidating security agent Lisbeth salander, the mysterious computer mastermind who has no place for warm feelings. Their menacing journey to unlock the truth encounters deadly secrets within the vanger family, the ones that the murderer threatens to keep ensconced no matter what it takes. An interesting fact is that it takes place in the land of Kronas (Almighty Sweden!). I found the beginning slow-paced which made it hard for me to get into the whole book’s setting. (The devoted Blomkswit’s introduction goes on to about 100 pages!). But after the actual mystery starts, it really grips you to a point where you cannot put the book down. Larsson drives the readers anxious to know what exactly happened to Harriet. The final suspense might not have thrown me off the chair but i thoroughly enjoyed how the plot’s pieces went together. Now for the characters, My! My! Our Lisbeth salander is the unexampled star of the book and Mikeal was also framed to a T. I really appreciate Larsson for idealizing such complicated characters and i would definitely recommend reading it even if it is off your typical genre list. That was an intense ride..In the suspense’s climax, the graphic description where martin reveals how his each victim was tortured and punished reflects the harsh reality of domestic violence against women, to think humanity could be so cruel! Our Harriet, as guessed in the beginning is alive and breathing because of her cousin, Anita who helped her escape from Martin’s crutches. Mikeal and Erika’s complicated relationship adds a little touch of humour to the book. And Oh can i talk about salander??! Wow, that brutal scene with Bjurman was haunting but the way she handles the situation to successfully gets her revenge (Yah, you go girl!). Frankly, I wasn’t that surprised about discovering Martin vanger as the murderer because i was able to connect the small hints that the author left by before starting each part of the book.I loved the way every nook clicked in to wrap up the whole story behind the lost Harriet. The last chapter ends with Salandar heartbroken on seeing Mikeal with Erika. She turns her heel in the opposite direction and the book ends showing the pain that she was stung with. Ahh, What a tragic way to end….